This project has very much been formative for the way I now approach creating. It has been my transition from 2D to 3D. From a design to an art process with a completely new and much more loose approach to the process of creating. 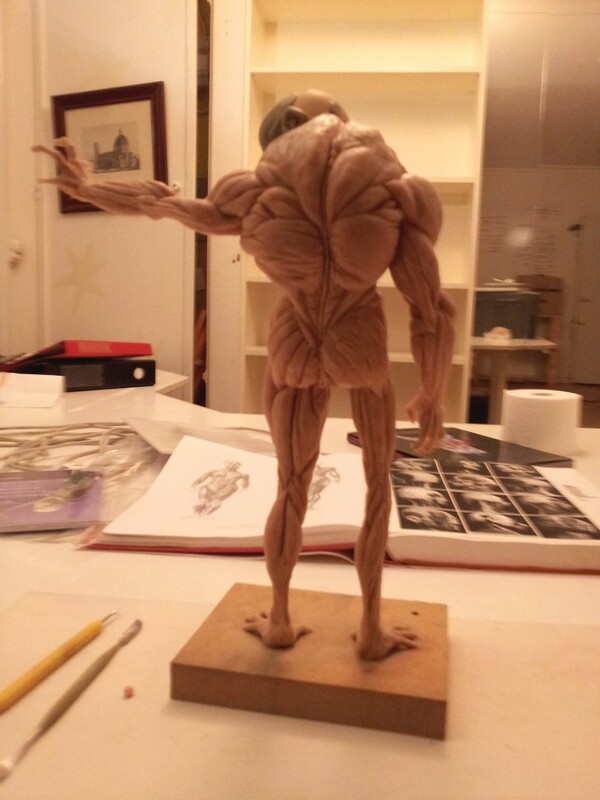 I knew I wanted to study Anatomy and sculpting process, techniques, tools and materials. Other than that I initially had little aspirations as to the end results here of. The character was taken from a quick drawing in a sketchbook. Coming from a traditional design background I wanted to try a more loose approach, starting with something just visually appealing and building more of the design and story in the actual process. From the sketchbook drawing an armature of aluminum wire, cibatool pieces and enhanced with Epoxy and Apoxie, were made. Made to split in half in order to fit the model in a small electrical oven, the piece was originally conceived of as a one piece marquette. 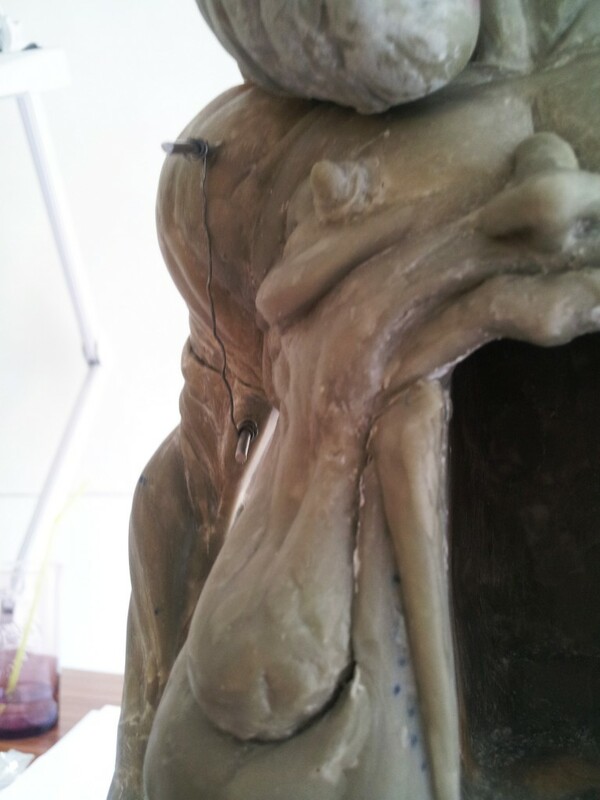 The sculpting in Sculpey then commenced on top of the armature. Sculpey is a polymer clay that is workable till heated at a certain temperature per square inch and was chosen as an easily accessible and forgiving material to work with. Over the next period I would adjusting the design for three dimensions and build the layers of muscle, readjusting for new design ideas. 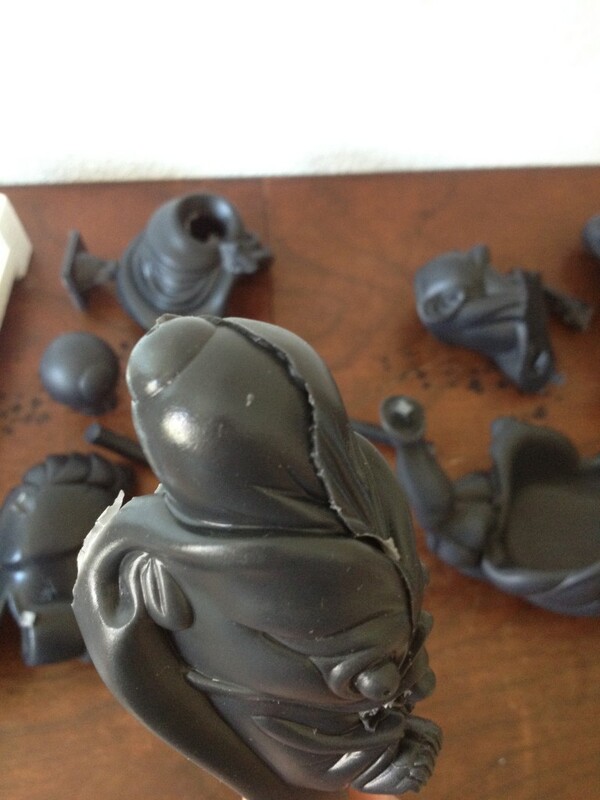 Reviewing the cure Sculpey material, it left a lot to be desired in regards to finish and durability. Having recently been introduced to the Apoxie material and seen some of its properties I was highly inspired to test this material out with the hope that it would provide a satisfying result. 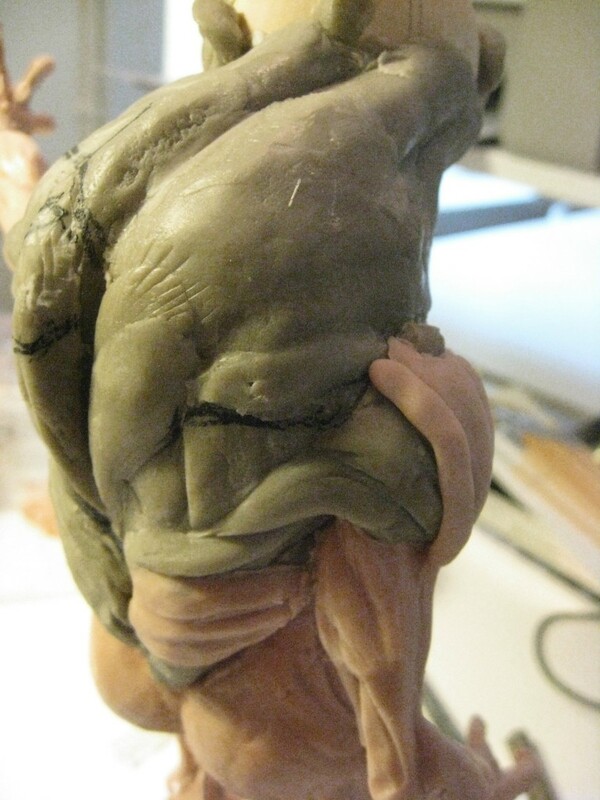 After considering wether to start a completely new sculpt it was finally decided to replace the Sculpey with Apoxie on the armature already made, piece by piece. In the coming periode the figure would completely change it’s proportions, posture, number of parts, expression, story and persona. As the substitution and restoration from one material to another commenced, at times muscle groupe by muscle groupe, ideas of altering the proportions and stature entered. 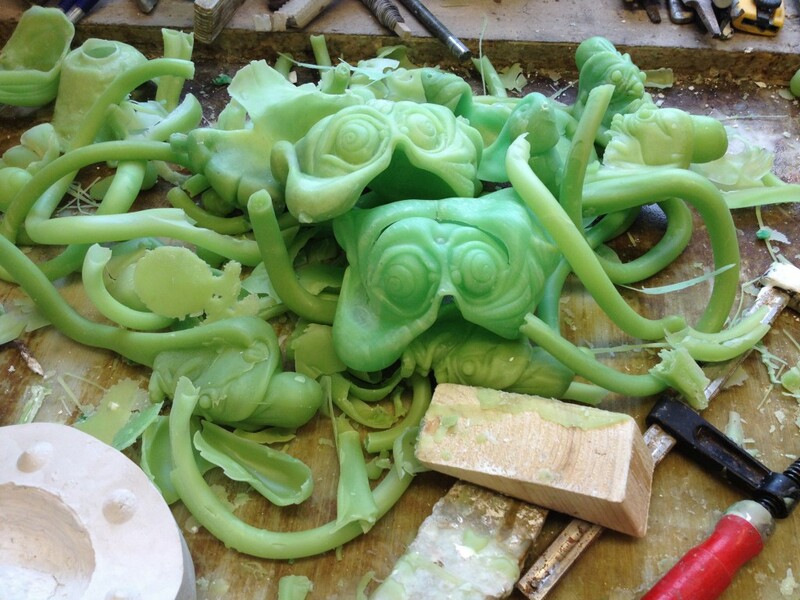 Limbs were cut apart and prolonged, switched around, I think I did everything not suggested in a good clean process. 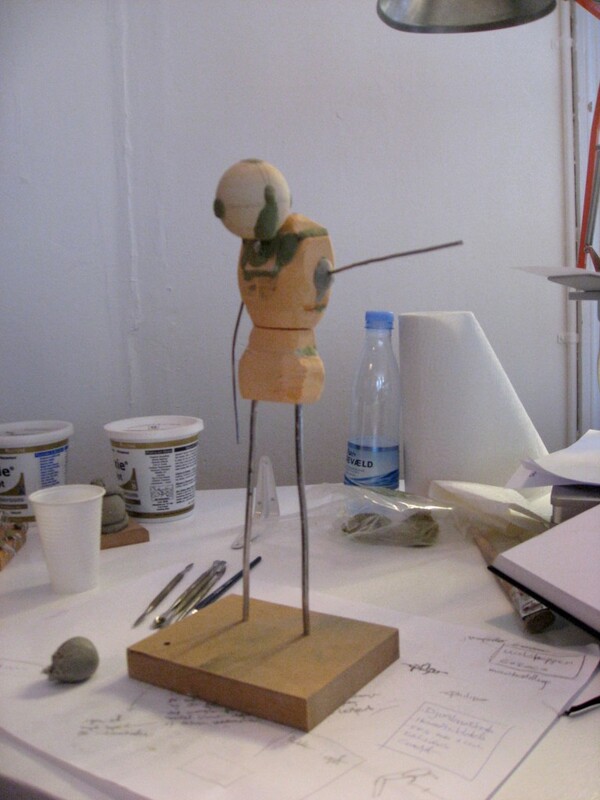 With accompanying studies and cross referencing in anatomy, new ideas began to form. Studying anatomy I realised how many parts of the body is mirrored in function or form and started experimenting with changing parts around. hands became feet and vice versa, noses, eyes and features started to allocate themselves and the idea of layers and states emerged. It seemed every time I hit a wall with the design I would split the figure into more parts and process would eventually progress through that. It also perpetuated the idea of the character existing in other states of being and so the universe and the character emerged from within the process. I was also intrigued by Anatomical terminology and one variation of the Illac furrow caught my interest, also known as the Adonis Belt. An thus the figure was named and the theme and universe arose. After many iterations and adjustments the whole piece was finally sanded down with sandpapers, files and powertools and tested for surface errors with thin coats of spray primer. 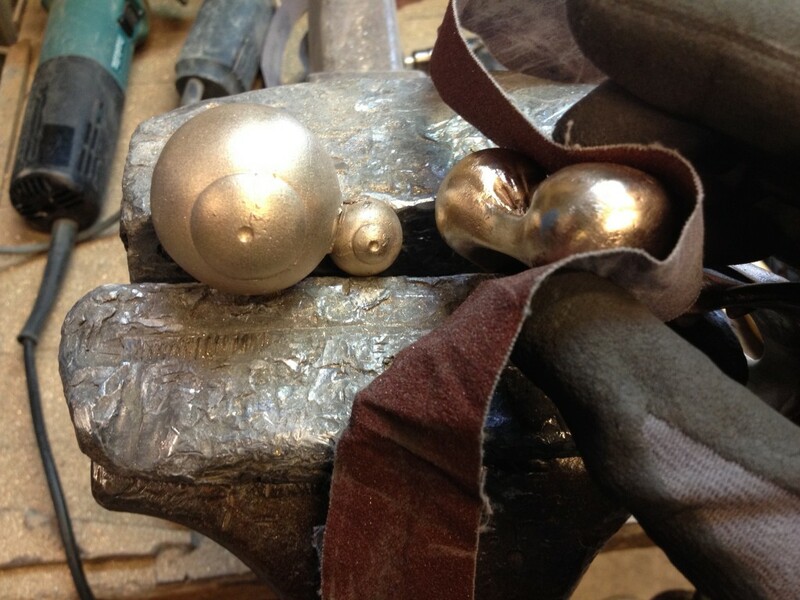 A process that took a period of about 3 months, fitting, correcting, optimising and learning the nook and crannies. Next step was figuring out what to do with the piece and all of this work. 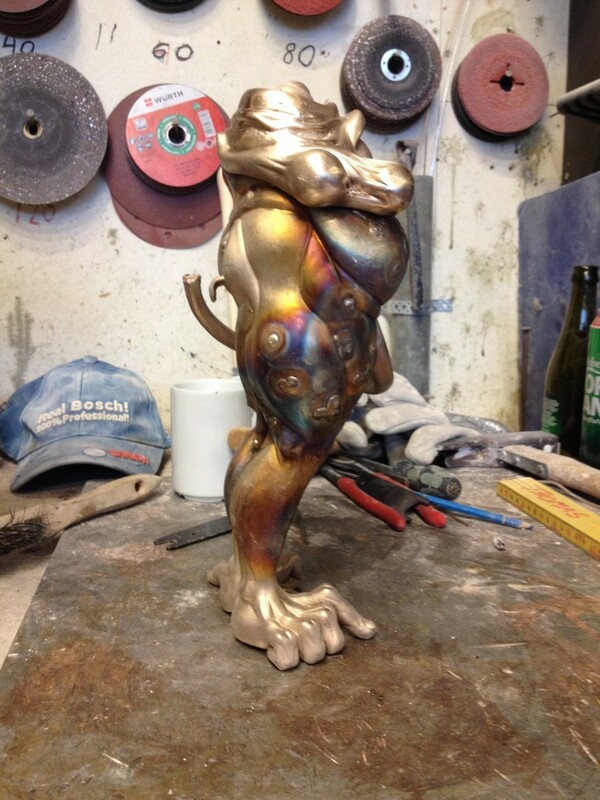 It was decided to try and have it made as a small limited run in Resin. I contacted local workshop working mainly in special effects and commercials. However facilities weren’t promising and prices were way to high. Looking also into overseas production, however that also imposed many risque factors, not being able to deliver it in person, possible customs issues with shipping and more. A deal was finally made with a private caster located in Belgium. So in May 2013 I made a one day trip to Belgium, to hand over the prototype. 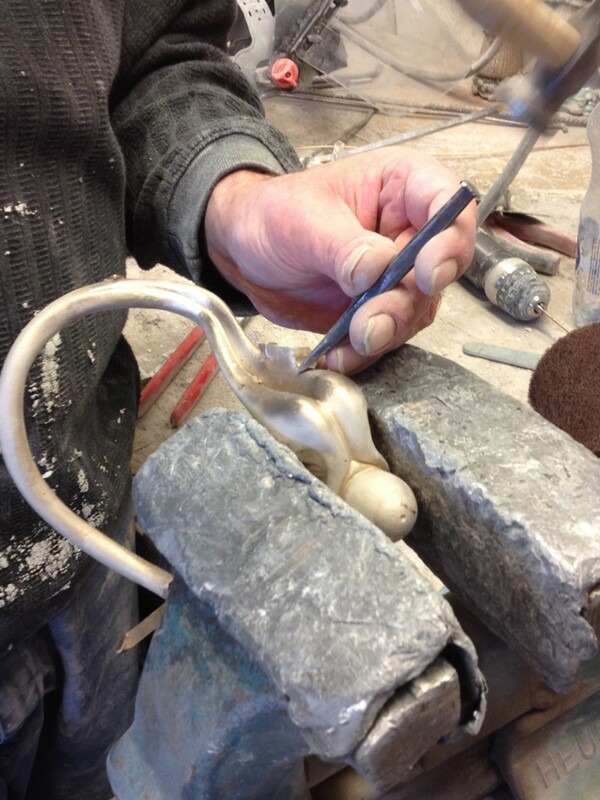 A price was set and an agreement was made for two months for the first set of castings to be delivered. A year and a half passes from the Belgium handover, going from a good meeting with good communication to a caster unreachable for months at the time, not signalling wether the production was underway, lost or abandoned. 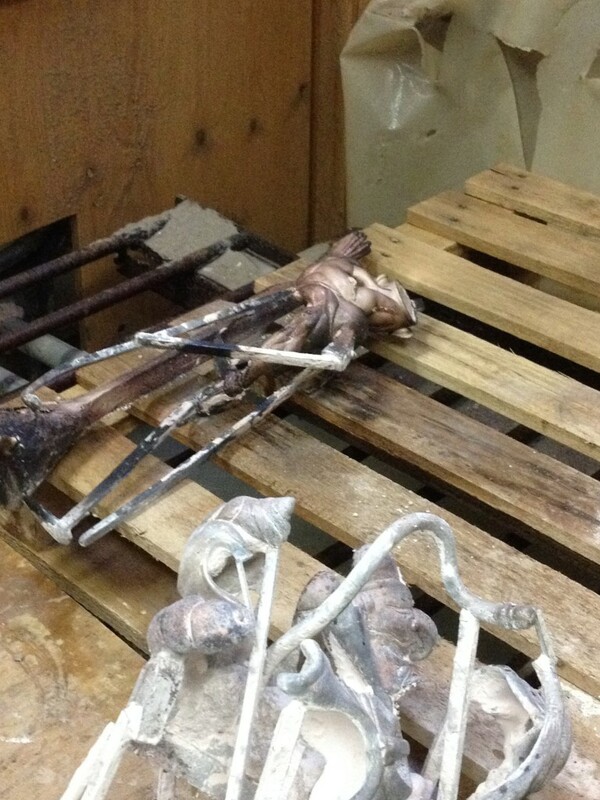 On September 18, a reproduction finally arrives of unfortunately heavily flawed castings. The decision was made to stop the production in Belgium and call the prototype home. The prototype arrived with many pieces broken requiring hours of work to fix. What next? Drop the project? Start over? 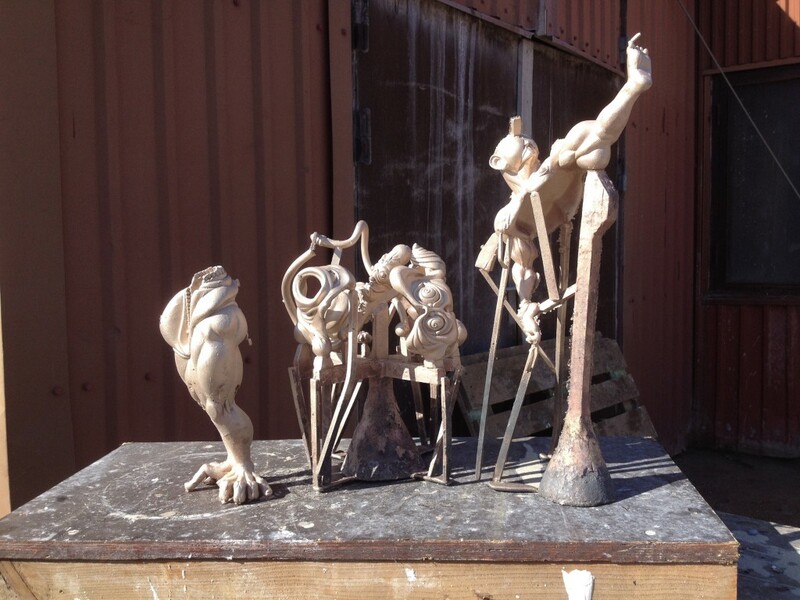 Returning to a discussion with an acquaintance, from prior to sending prototype off to for Resin casting, I started to pursue contacts in bronze casting. Located in Denmark, out of local town, that lead eventually led me to a prominent local caster. 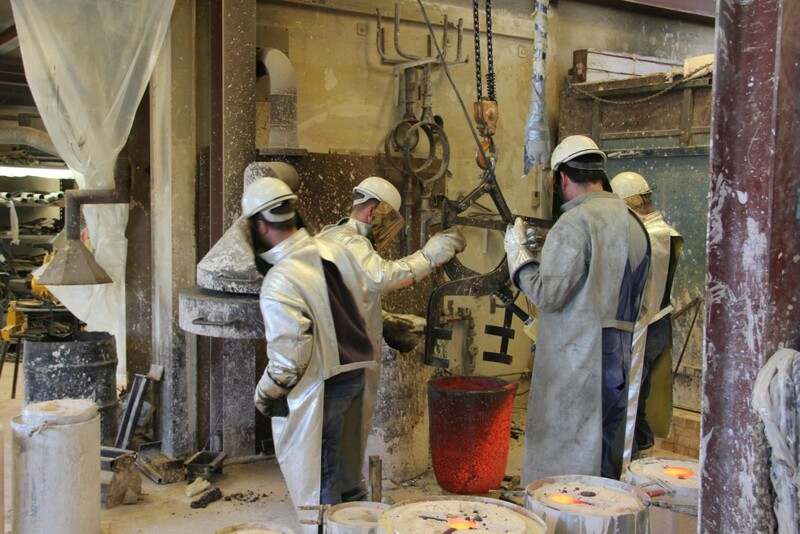 After an initial meeting and showing of the prototype it was agreed that the foundry would undertake the making of rubber molds from the prototype and the casting of the actual bronzecast. 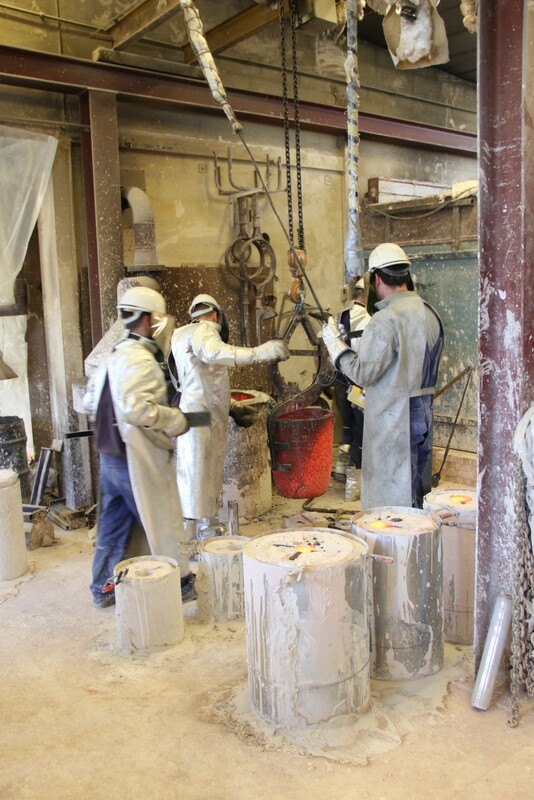 Where as I would myself undertake the task of casting the wax version from the rubber molds and the main part of the rendering of the bronze cast, under supervision by the foundry workshop. The Prototype was handed over by the end of the year 2014 and rubber molds finished early 2015. 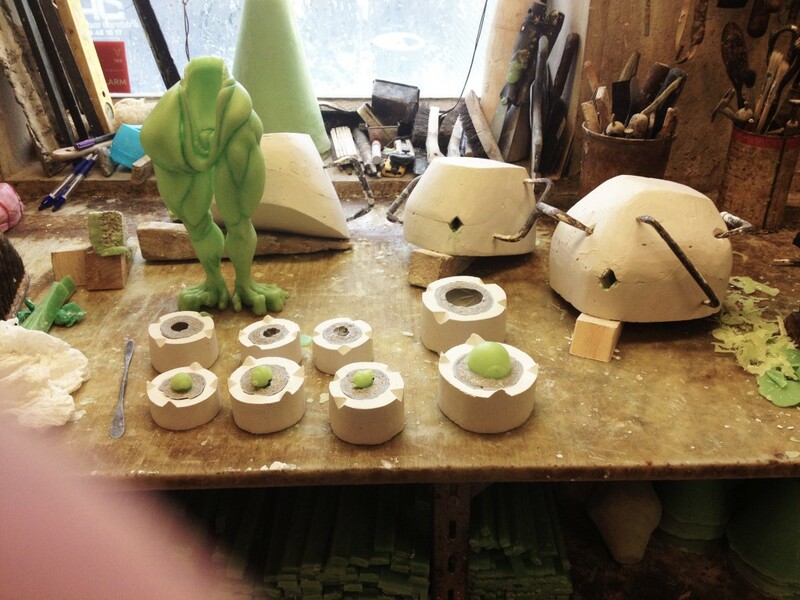 Rubber molds were finished in mid February. 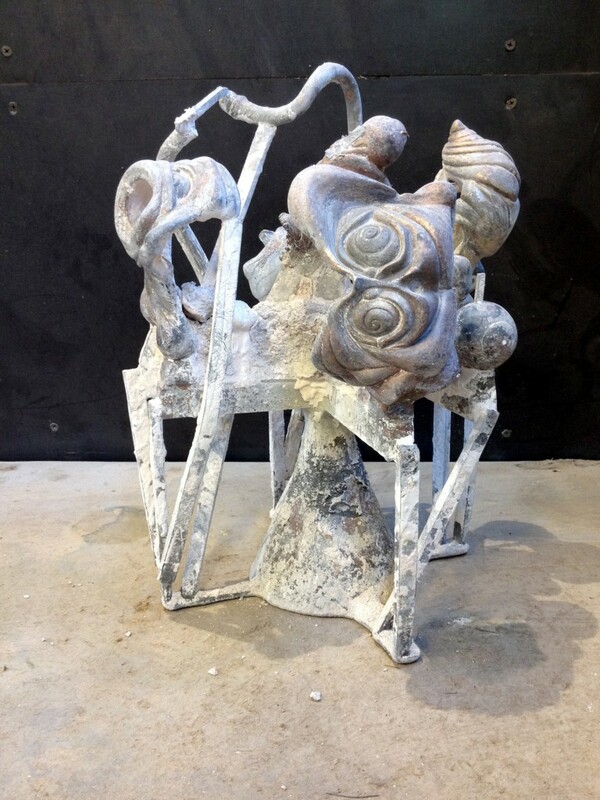 Cast with a rubber core and an intricate plaster cape. 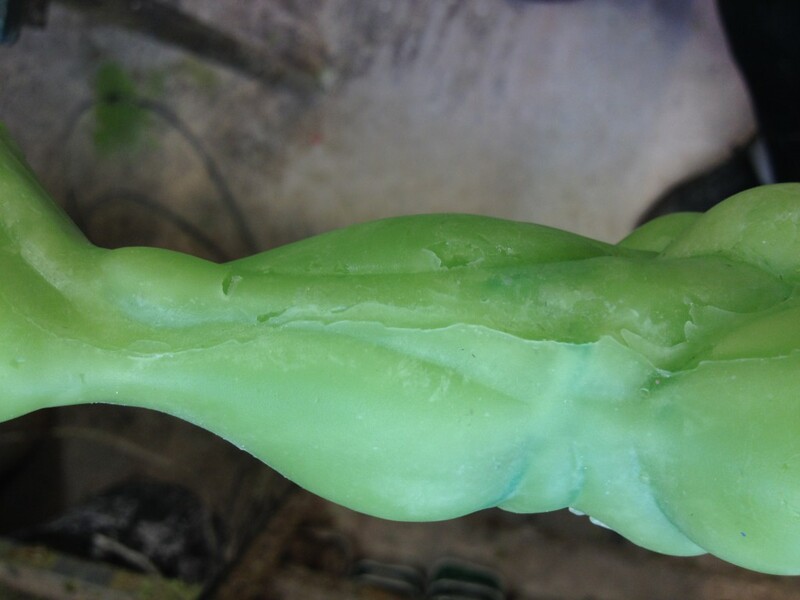 The wax reproduction could now begin. Taking about a three week period by trail and error to learn how to work the molds, technique and material. It finally succeeded, producing a set of usable parts. 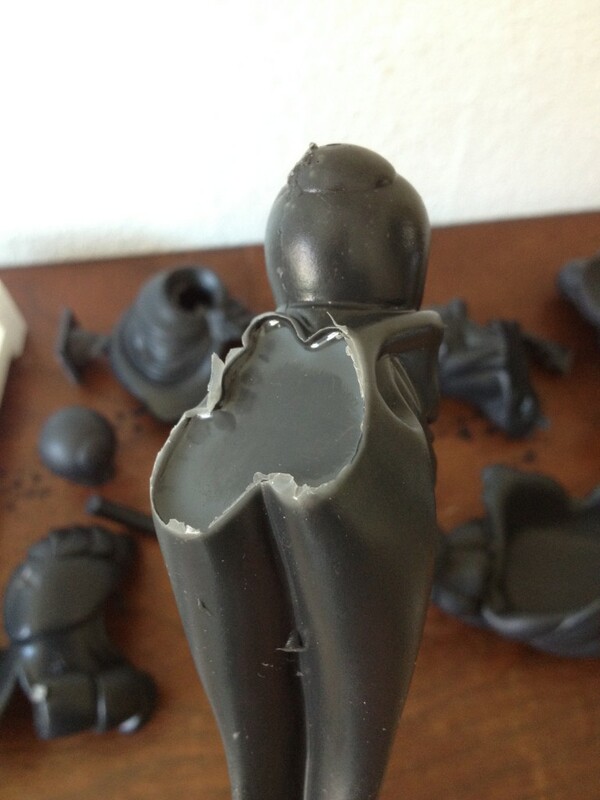 Pieces were all hollow cast. This prevents the wax from morphing and shortens the burnout process, where the wax is melted or burned out of the plaster cape. 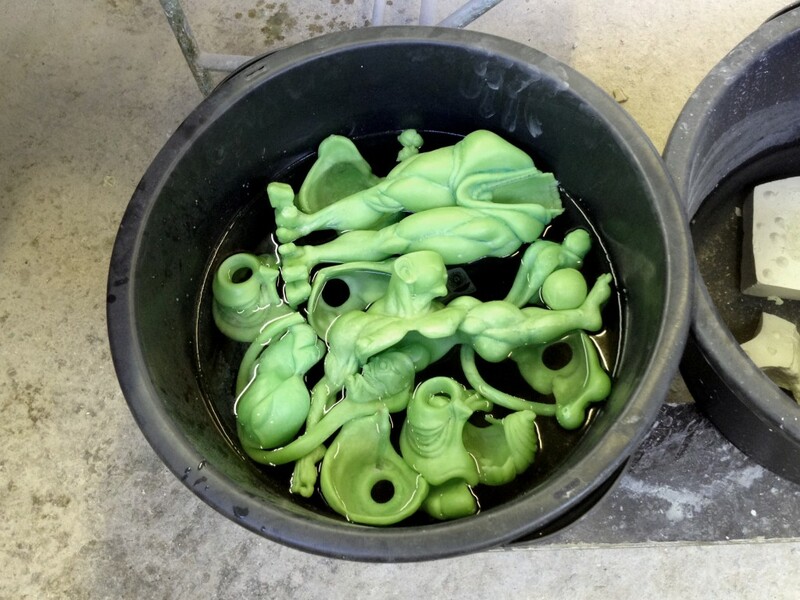 Wax pieces were stored in a tub of water to prevent it from morphing before casting. This process took about six to eight weeks. 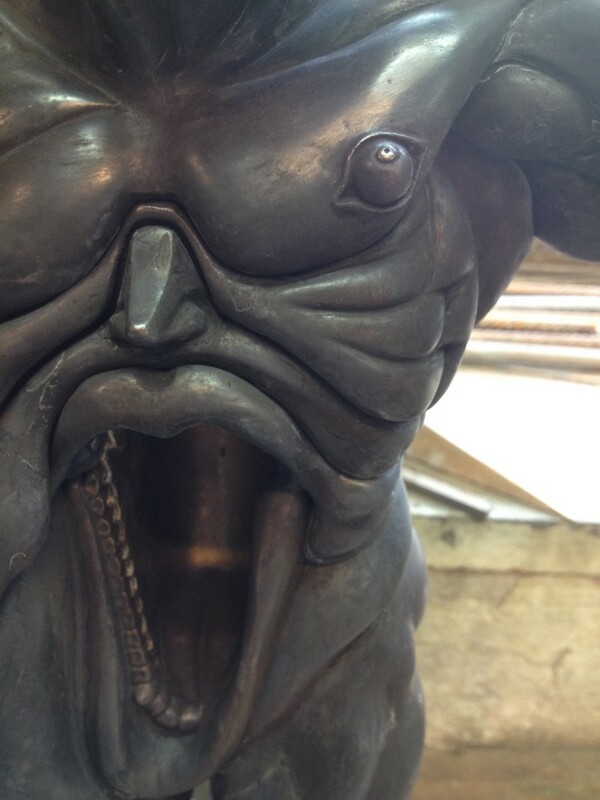 Having to wait for the foundry’s schedule to fit and the molds to thoroughly dry. 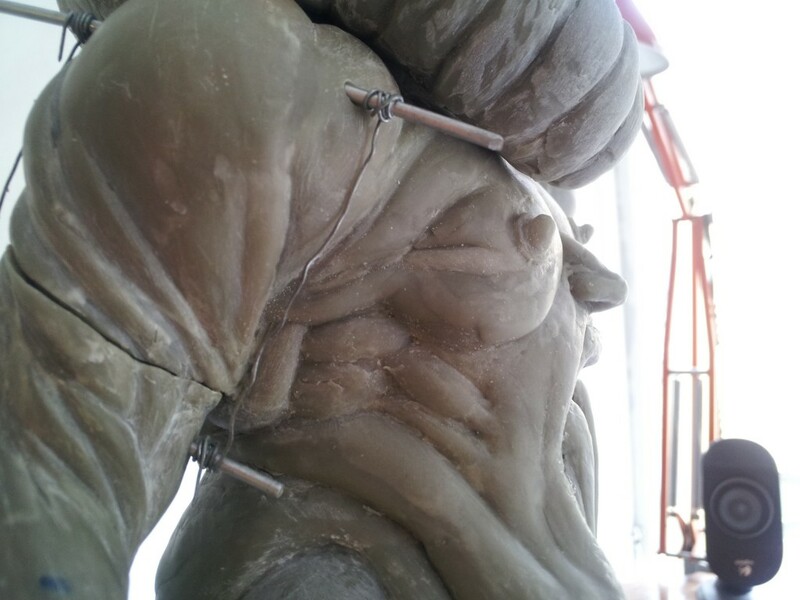 The wax casts were added sprues and were cast in a plaster cape and then placed in an oven or kiln and at low heating, over a periode of weeks, the plaster is dried and the wax melted or burnt out of the mold, leaving a hollow space to be replaced by bronze. 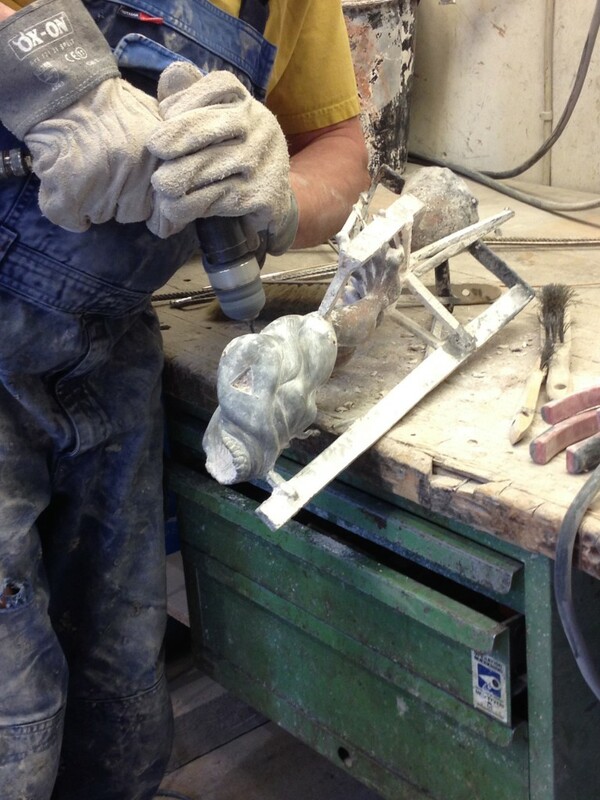 A method called lost-wax or precision casting. 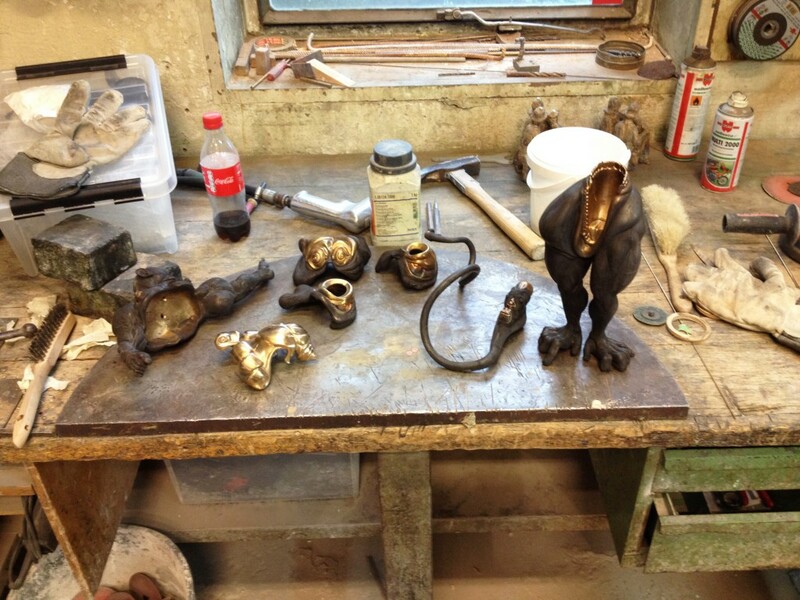 The bronze casting plays out much like a ceremony. Each of the workshop member have their part to play and they emerge one by one fully dressed in protective gear. 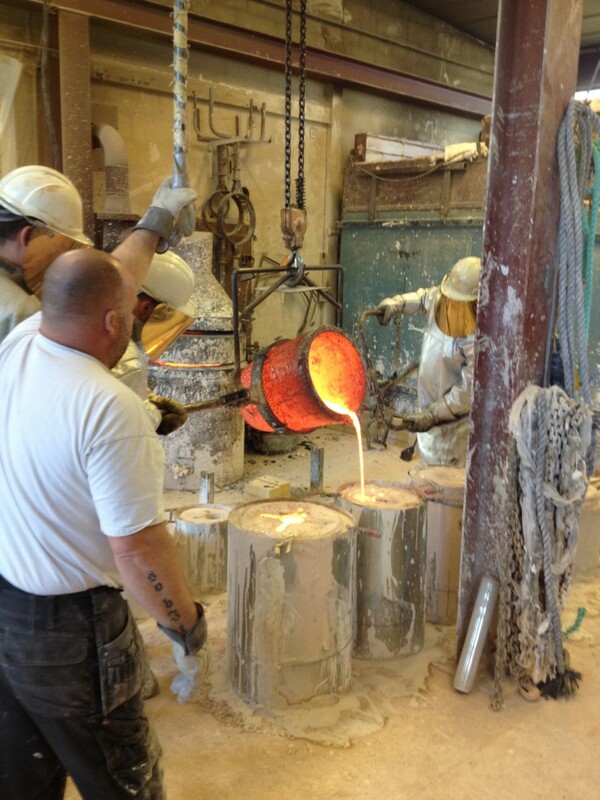 A melting pot is taken from the kiln and the molten bronze alloy is poured into the readied plaster molds, transported by a crane system. Once fully cooled, it is now ready for demolding and assembly. Touch up and rendering can begin. 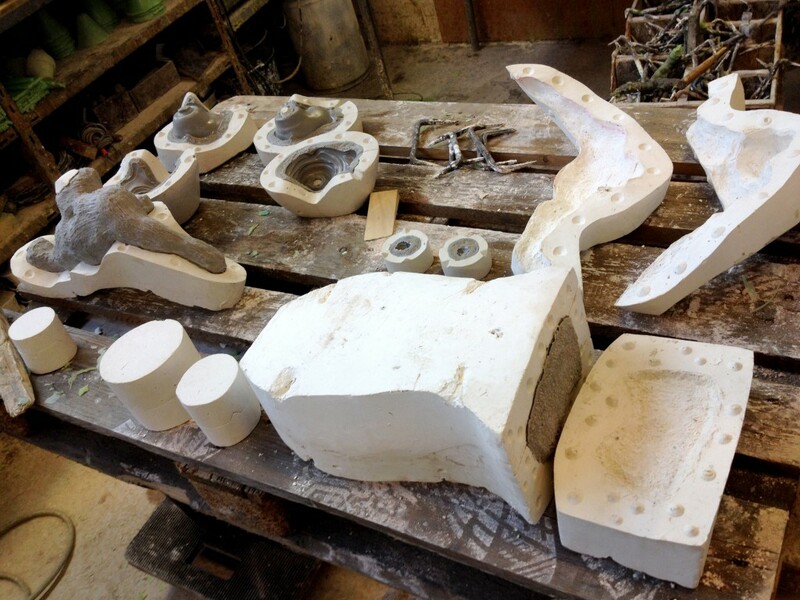 The castings are first broken loose from the plaster molds, One part was hollow cast and excess material had to be cleaned out from the inside as well. 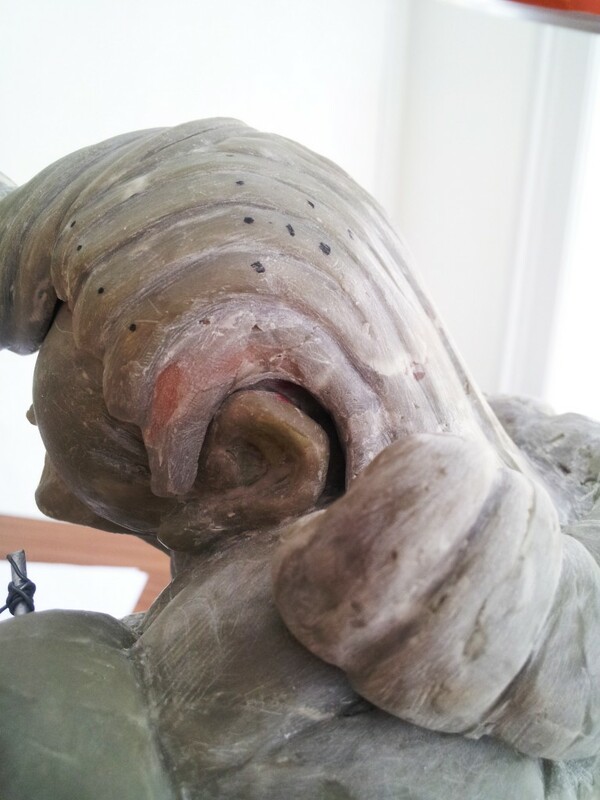 It is then lightly sanded down to remove the last of excess material from the plaster cape. 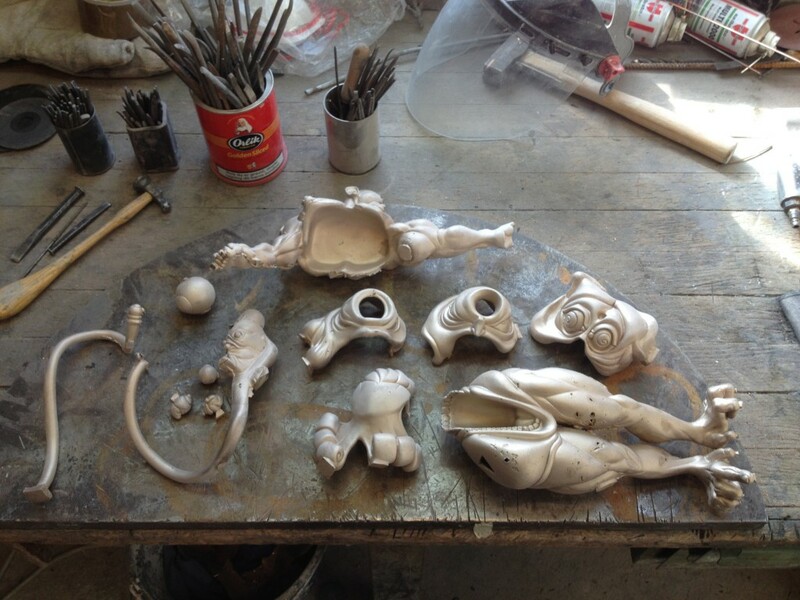 Sprues, Flashes and other casting errors are removed or welded out. 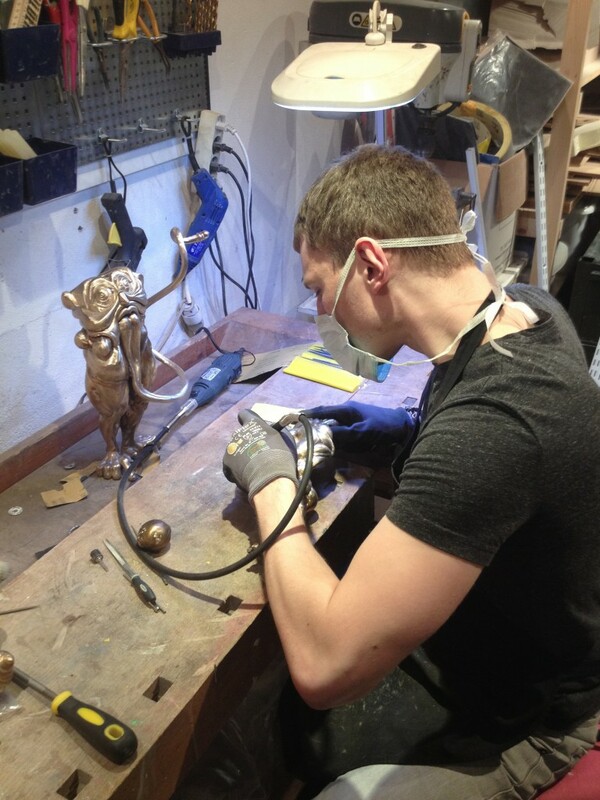 The last part of the rendering is hours upon hours of adjusting pieces, welding errors, using sandpaper, files and various powertools to achieve the desired finish quality. This last bit took a total of three to four months. The patination proces is a way of treating the surface of the material to change it’s color and possibly structure as well. 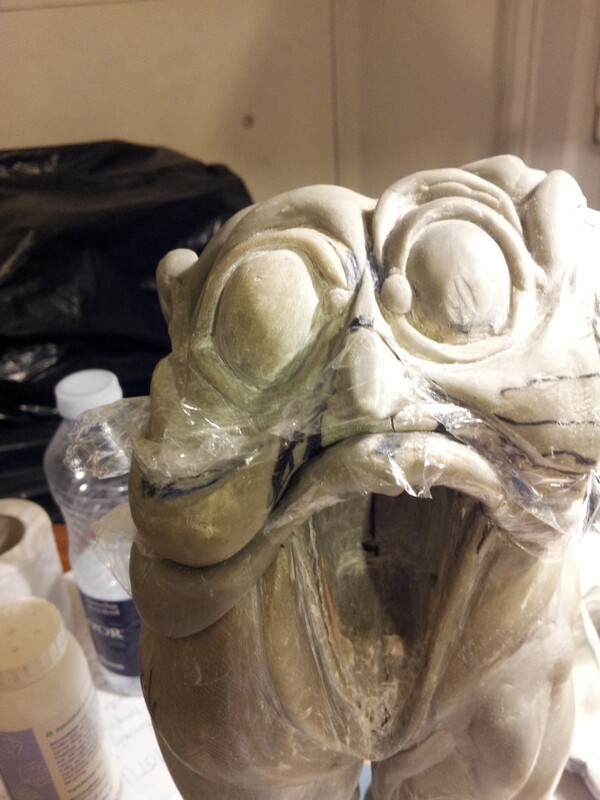 Depending on the color and desired effects a variety of materials and techniques can be used. 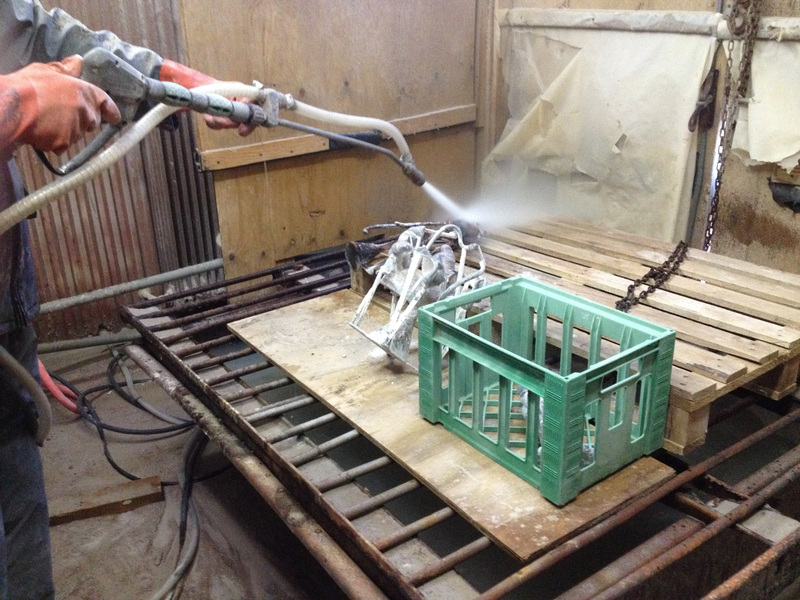 The coloration is very dependent on the surface structure of the material, welded and cast materials do not have the same density and sanding and surface treatment have an effect on the structure of the surface and the way it takes to the patination. Three different materials were applied for the black parts. 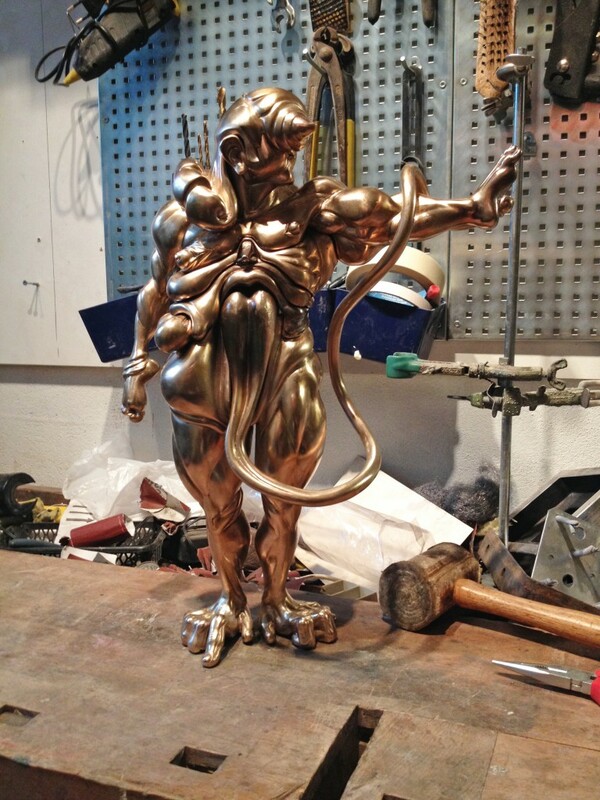 First a Sulphur solution that is applied with a brush and heated unto the surface releasing a chemical effect causing the surface of the bronze material to turn black. This proved very problematic to control so a second material was tried out in the form of Chinese Tusche, which is more of a layer on top of the surface. This gave it a more homogenous tone but also threatened to turn the transparency of the sulphur patination more oblique. So finally a “secret” solution was produce and applied. Upon asking what is was i was told that I didn’t want to know, not because it was secret but on account of it being “disgusting”. So I did not ask further. Many tests were done for the red parts in the eyes and the final application was airbrush applied with a brush and coated with lacquer. 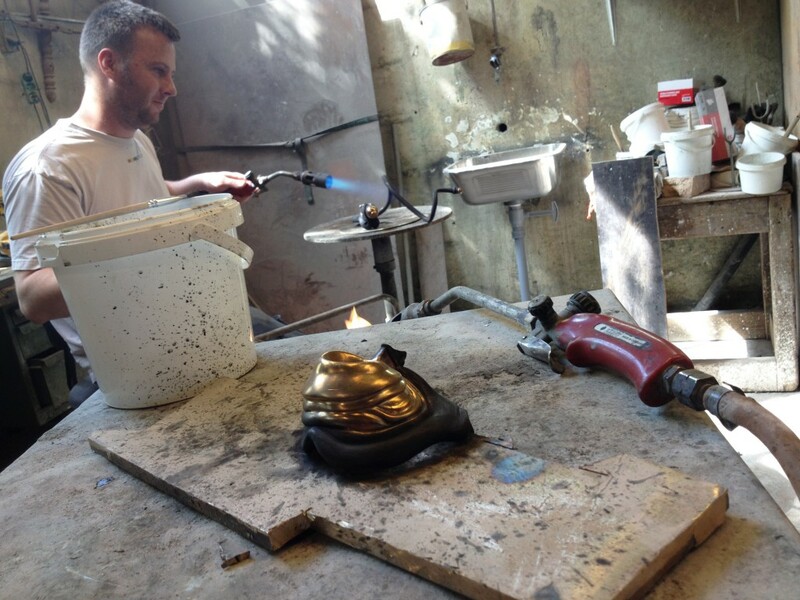 In order to seal the patination and make it last longer a layer of wax is heated unto the surface. 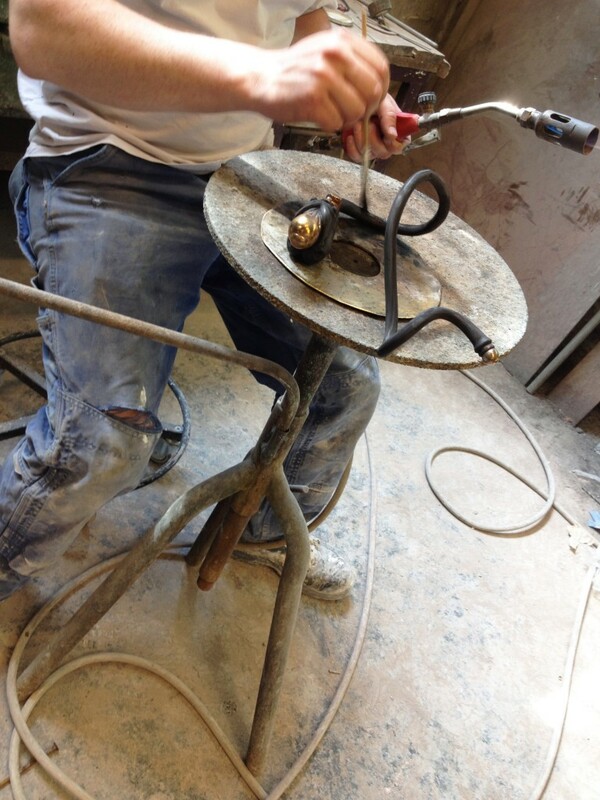 It being of the utmost importance and difficult to undo I left this final task to the hands of the foundry workshop. 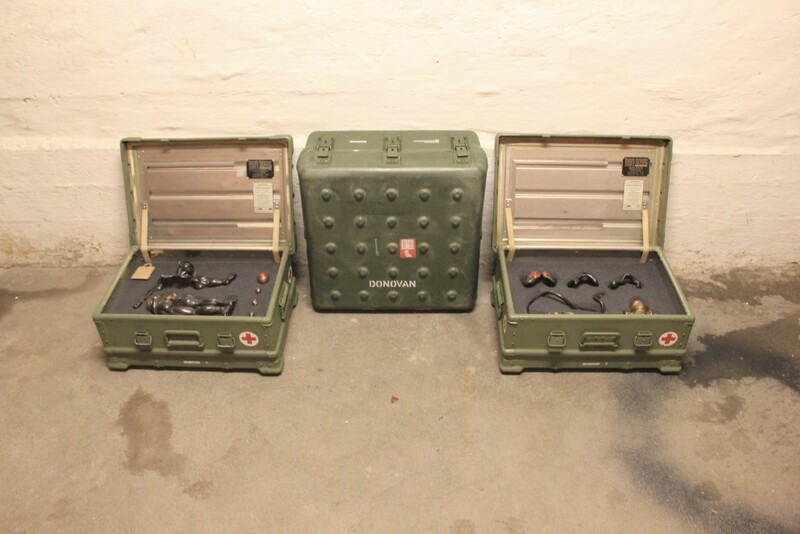 The figure is packaged in transport cases, one set of transport cases and a display case, both with foam inlay.